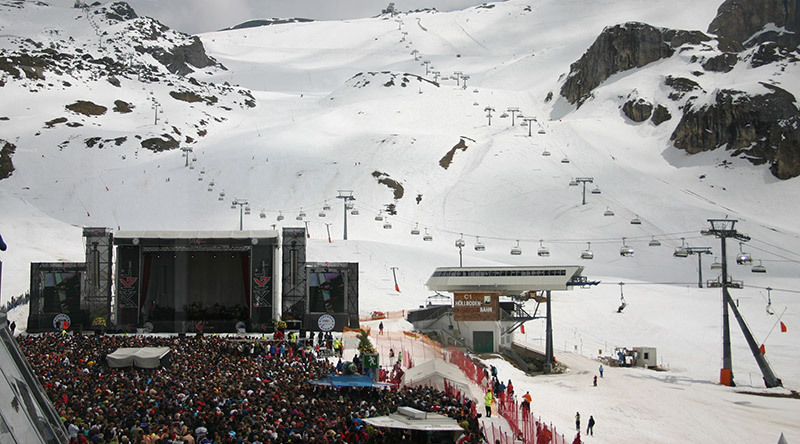 The Top of the Mountain concert officially closes the ski season in Ischgl and these shows alone are well worth the trip. In years past, performers have included Alicia Keys (pictured here), Rihanna, Kylie Minogue, Katy Perry, Pink, Elton John and even the enigmatic Bob Dylan. English rock band Muse headlines this year’s spring concert on Sat, April 30. Photo by Nathan Van Schaik. ISCHGL, Austria — Here, we are all party animals. Fueled by local brew and inspired by mountain-shaking music, table dancing, the thin air and, oh yeah, the best skiing in all of Europe, we pound our chests and howl at the moon. This is the melting pot of cultural elitists, rock music enthusiasts, ski fanatics and other freaks all at wits end of Europe’s pent-up wintry cabin fever where, during the last weekends of April, it all erupts and pours into the streets leaving behind a tumultuous trail along the ski slopes. It is where old school American beer commercials fade into a sort of surreal, mind-numbing reality in the Alps. Ischgl is a remote ski resort town tucked within Paznaum Valley situated in the Austrian state of Tyrol on the Swiss border, or about a two and a half hour drive southwest of Munich. The ski season runs from December through April but it is on the last weekend that you’ll want to visit. If not to relish the last opportunity to ski for the year, then at least to absorb what Europeans can teach Americans about letting it all hang loose. The Top of the Mountain concert officially closes the ski season in Ischgl and these shows alone are well worth the trip. In years past, performers have included Alicia Keys, Rihanna, Kylie Minogue, Katy Perry, Pink, Elton John and even the enigmatic Bob Dylan. English rock band Muse headlines this year’s spring concert Sat, April 30. If you go to the concert, don’t worry about purchasing tickets. There’s only one way to get to the stage at the summit of the mountain at Idalp: by using one of the resort’s heated, high-speed lifts, which are arguably the best in the galaxy. That means you’ll need to purchase a €75 daily lift ticket. Stay for the weekend, opt for multi-day ski passes costing only a few more euros and get in some time on the slopes. Don’t worry about booking in advance. You can get these passes upon arrival. Ski in the morning and rendezvous with friends at the concert grounds by early afternoon. The music starts at 1 p.m. The skiing is certainly what has put this village of only 1,500 inhabitants on the map. Certain circles of Europe’s veteran skiers dub Ischgl as a B-rate resort relative to some of Austria’s other primo locales like Soelden, St. Anton or Kitzbuehel. But that’s pure snobbery. The skiing area in Ischgl is known as the Silvretta Arena. It boasts 140 miles of slopes with 41 cable cars and lifts offering a transport capacity of 83,100 passengers per hour. If skiing is what you’re after, go early. The highest point, the Palinkopf, tops out at 9,500 feet, providing a mile-long slope while the “Boarders Paradise” boasts a barrage of half-pipes and obstacles for the adrenaline junkie. Additionally, there is a ski school and a beginner’s area for novices. A word of warning about the skiing: Skiing habits for any region typically reflect the country’s driving habits. There are many Germans on the slopes. ‘Nuff said. Ischgl isn’t the place to bring your grandma. In addition to the full range of extreme sports you can enjoy there, flirting practically counts as one of the trend sports, according to the city’s website. The nightlife is phenomenal if you’re under the age of 30, or else act like it. Fire and Ice is one of the hippest bars, and at Trofana Arena you might even spot a recognizable Hollywood face. If low key is what you’re after, check out the Golden Eagle Pub for pints of English ale and classic rock jams. Hotels and bed and bed and breakfast joints fill up fast so book early. Try to keep it close to Silvretta Strasse. This is the town’s nerve center and accommodations along this street are within walking distance to the lifts headed for the concert. Keep yourself oriented in town by knowing where the three giant main cable cars are located departing Ischgl westbound across the river and up the mountains. If you can find a hotel near any of these three, you’re golden. A resort town solely dependent on its tourism demands a state of the art, user-friendly website. Ischgl’s delivers on all levels. The site, ischgl.com, offers everything you’ll need to know in English. Interactive maps, hotel finders, updated weather and ski conditions, rental information and even live webcams will help you plan your whole trip from the comfort of your own home. If you plan to ride the train into Ischgl, you’ll have to travel to the Landeck-Zams station in Tyrol. From there, take bus line 4240 into Ischgl, which takes about an hour. Drivers will need an international driver’s license and valid motorway toll sticker known as an Autobahn vignette. You can purchase the stickers at almost at any gas station in Germany or Austria for about €10. Affix it to the inside of your windshield or risk a hefty pay-on-the-spot fine from the grumpy, take-no-guff Austrian police.